What a PANTASTIC day we spent with Lois and Richard kicking around Georgetown University. Bling Bling especially loved the bright pink sweatshirt in the campus bookstore!! Woo Hoo she is HOT! A stroll over one of the canal bridges by the university brought us to a gorgeous mall we could duck out of the heat in on the way to lunch by the river. Bling insisted on posing but Lois and I were BEARY afraid for her safety so we asked her to please get off the railing!!! 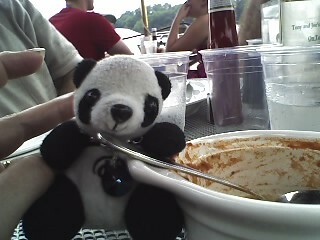 Crabchowder was pantastic as well as the giant shrimp cocktail lois and I had sitting at waters edge. The boys had some incredible looking sandwiches too!!! The day went by entirely too fast and now we are just getting ready to head out to take a train to Baltimore….then onto our flight home. THANK YOU Lois and Richard for such a memorable time and we hope we can return the favor by coaxing you out to Portland for a vacation!! Will be adding more pix to the blog soon..we used our new GPS to google map our entire trip to correspond the the photos I took so this will be fun to see how it works. Now Sandy…For the record, I think SOMEONE is having too much fun with her panda!!! LOLI can’t wait to see more pics of your trip!! !